Is there really a God? Personally, I have asked myself this question more than a few times. On the other hand, my children have not. They have been taught without question in the existence of God, who created the world, who spoke to our forefathers, and who we pray to daily. 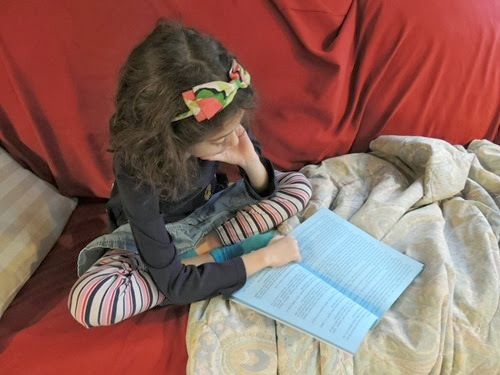 Even so, Gabbie (age 8.5) was very interested in reading this book, in order to learn about what other people believe. The book begins with what I see as a major issue – the existence of Santa Claus. Like most everyone in America, the book assumes the reader celebrates Christmas. Yet, on the very first page, Franklin realizes that Santa Claus, like the Easter Bunny and the Tooth Fairy, is not real. If you want your children to believe in any of these things, you do not want to read them this book. Poor Franklin. With his believe shattered, he starts to question. If Santa Claus isn’t real, is God real? Franklin begins a journey to learn about various world religions and what they believe about God. Lucky for him, he has a grandmother willing to teach him all about science, and how it is hard to prove something you cannot see or touch. To her, God cannot be real because feelings do not prove the existence of something. However, she is willing to introduce Franklin to a professor of Greek civilizations who starts out Franklin’s research with information about the Greek gods. In this section, Franklin learns that the Greeks believed in many gods, just as people today believe in other gods. From there, Franklin learns about Buddhism. He quickly learns that Buddhists think it is more important to live in the best way possible than to worry about questioning God. He goes on to learn about the rules of the Eightfold Path, which is a list of rules Buddha made to help people end suffering by becoming better people. Having learned about the Buddhist religion, but not whether or not God is pretend, Franklin moves on to learn about Judaism. Franklin goes on to present a report to his school class about the solar system. His class discussion veers off into discussion on whether God created the universe, which leads his grandmother to introduce the big bang theory. This of course is meant to show that the universe could exist without God. The book concludes with Franklin acknowledging that he liked things about each of the religions he learned about, but most of all he likes that science can answer his questions. He seems to conclude that God is mysterious, but science is not. For me, as a religious person, this is not the conclusion I would want my children to reach. I have no problem with them learning about other religions, and what Franklin learns about religions is certainly interesting. However, seeing that the information about Judaism seems to be skewed towards those who don’t believe in God, I’m not sure I can accept the information on the other religions at face value either. Did you like this book? Yeah. What did you like about it? It was interesting. What was it about? Different religions. The boy in the book likes science. His name is Franklin. He does believe that the Earth may not be made by God, but he likes learning about other religions. He thought it was confusing to understand, it is hard to understand that God made the world. Do you think God made the world? Of course I do. Because that’s what our religion believes. Did you learn anything? I learned about other religions. 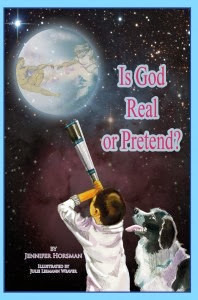 Is God real or pretend? Depends on what religion. Can you give me examples? Hindu, Buddhist, Jewish, Christian and Muslim all believe in God. Is there anything you didn’t like about the book? No. Do you think other people should read this book? Yeah, my age and older, because you need to understand it. You have to be interested in history and stuff. It is beautiful to me that even after reading this book Gabbie still has a strong belief that God made the world. If your child has strong faith, this book may be worth reading as a learning tool about other beliefs. However, if you believe in God and your child is questioning, I would not recommend this book as an answer.